My name is Leonard Stephens and I am the managing partner of Perfect Performance, LLC (“PP”). PP is a sports performance training company located in many locations in the Washington DC Metropolitan Area. Our company is committed to improving the performance of young athletes by teaching them detailed fundamentals, skills, and techniques. 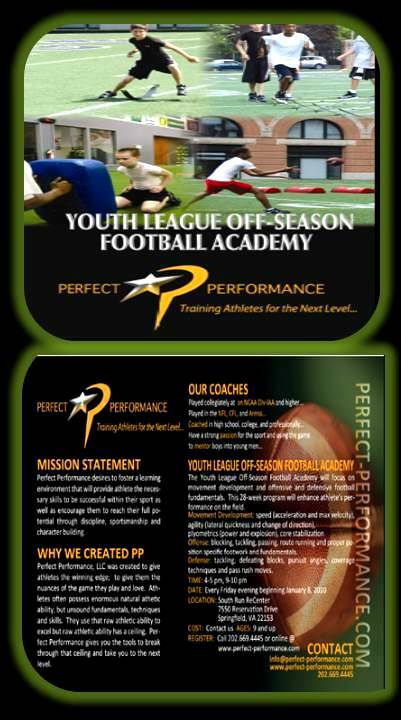 We invite you to enroll your son in our YOUTH LEAGUE OFF-SEASON FOOTBALL ACADEMY. Register today at www.perfect-performance.com/ylacademy.html to reserve your spot!!!! Call me with any questions. 202-669-4445.